The increasing utilization of heavy lifting equipment to carry loads at higher levels has accelerated the pace of tower crane market. To meet promised timelines, construction personnel are increasingly adopting advanced equipment like tower cranes for projects involving skyscrapers and other infrastructure. Technological advancements in the industry have also propelled the adoption of equipment such as anemometers, data-logging devices (black boxes), and GPS trackers which help monitor cranes more closely. Furthermore, the integration of electric motors and hydraulic systems has enabled the industry to adhere to the stringent low carbon emission standards set by the mining, construction and utility sectors, which has further supplemented the growth of the global tower crane market. Elaborating further, it has been observed that a major trend gaining momentum in the aforementioned industry verticals is that of renting equipment. Given the rising labor costs and the demand to complete construction projects within the stipulated time, companies are often found renting vital equipment so as to minimize the costs of purchase – a fad that has led to the expansion of the global construction equipment rental market. Consequently, this has also helped augment the commercialization graph of tower crane market from rental applications. Armed with the intent to save costs, construction companies have been found to increasingly rent tower cranes to address the growing demand from the utility, infrastructure and construction sectors. Several rental companies in North America and Europe are now offering support & services for repair, maintenance, and operator training programs. Powered by the extensive demand for these cranes from local contractors as well as established bigwigs, the global tower crane industry share from rental applications was valued at over $850 million in 2018. To cope up with the rapidly rising demand for container handling at different ports, shipping industry conglomerates have been constantly demanding more flexible and economical crane logistics solutions. Indeed, with government financing and the availability of low-cost labor, shipbuilding capacity has expanded considerably worldwide, in the past few years. However, to help lower investment costs and bring about efficiency and convenience, the deployment of high capacity models of modular tower cranes has become mandatory. The expansion of the shipbuilding sector would thus, in consequence, have an appreciable impact on the growth dynamics of the tower crane industry in the ensuing years. Speaking of the product spectrum, it has been observed that luffing job cranes have been gaining quite some traction in recent years. Luffing jib cranes are specially used in the construction of buildings in congested areas due to their very short counter jibs and adjustable working radius, which permits high productivity in narrow construction spaces. This crane model is certainly the best alternative for construction sites as it helps avoid any kind of crash or mishap with other cranes or surrounding buildings. Additionally, its vertical lifting features allows it to remain within the worksite, further ensuring safety to public and construction workers. 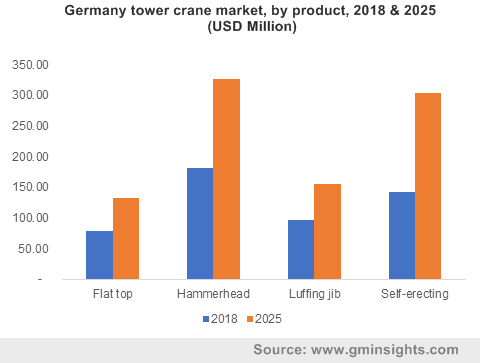 Powered by their convenience and efficiency, in tandem with the enforcement of stringent norms that will promote product adoption, the global tower crane market size from luffing jibs is expected to depict a CAGR of more than 5% over 2019-2026. Geographically, the Asia Pacific tower crane industry is expected to depict commendable growth prospects in the ensuing years, driven by the several upcoming residential and commercial projects undertaken across the economies of India, China, Japan, Singapore, Malaysia, and more. Certainly, the India industry in particular, can be credited with having witnessed significant growth owing to the rising number of smart city projects in the nation. According to the latest data from India’s Ministry of Housing & Urban Development, smart projects worth Rs 50,221 crore are currently under implementation, from which projects worth Rs 9,981 crore have already been completed. The country is also observing a massive surge in population & subsequent space constraints, which will support the deployment of construction-related machines like luffing-jib cranes. As per estimates, the APAC tower crane industry size is expected to exhibit a CAGR of 9.5% over 2019-2025. The proliferating presence of major construction & industrial equipment manufacturers worldwide has provided a major push to tower crane market. Rapid technological advancements have also led to the emergence of newer models that fulfill emission standards and offer work flexibility as well, especially in confined sites. Global Market Insights, Inc., claims that tower crane market size will exceed $5.5 billion by 2025.